Every morning when we pull out of the motel in Mojave, California we head west briefly on SR 58 before turning south on SR-14. We see the early morning sun reflect off these pinwheels up on the eastern face and ridgeline of the Tehachapi Mountains. After seeing these things from a distance day after day I drove five miles and took a look. I found out that creative scientific thought is not confined to Edwards Air Force Base in these parts. As you can see close-up these are wind turbines. Someone figured out the winds were steady and sorted out the most common direction of flow and set these up to harness Nature's wind to generate electricity. The press of preparing the the Blackbird to travel precludes my researching any details of this wonderful operation but it seems pretty neat. I spoke to a backpacker on the Pacific Crest Trail, the western reflection of our Appalachian Trail that passes through here and he said that hiking on a moonlit night between the spinning wind turbines was an awesome experience. Back on the jobsite at Edwards Air Force Base the cleaning and prepping continue. Marty worked on the spar assemblies while Jack cleaned the removed belly panels below the wing spars of about 40 years of crud. Ben modified and built boxes and stands for unassembled parts to travel east. I continued the exterior initial cleaning removing the thin but entrenched strata of desert dust. I was glad I had the chance to see other Blackbirds as they all have some unevenness of paint that is not so noticeable from fifteen feet out but more noticeable close up. Some of this is the age of the paint while some of it reflects the surface underneath. The titanium surfaces seem a pretty even flat black while surfaces that covered sensors seem almost shiny and irregular. One panel actually has paint flaking off so I make a note to talk to Lockheed-Martin for advice. Something interesting are the servicing notes ground crew have written on the ventral surfaces. Pretty neat from a curatorial view. I find the sun gets to be unmerciful when up on the top of the Blackbird so I wear a wide-brimmed hat and keep plenty of Gatorade in the shade below. I keep the bottle covered too to protect myself from whatever might be in all the dust I am generating. Slowly our Blackbird is evolving from looking dusty and forgotten into something that looks more and more operational. The Indiana Jones adventure movies highlight swashbuckling adventure with slight glimpses of the scholarship that leads Jones to the adventure. This is Hollywood of course but this is an important point. At the end of "Raiders of the Lost Ark" Jones is frustrated because the Ark of the Covenant has been locked away and probably lost forever in a government warehouse. After rescuing the Ark he wanted to study it, to fill in the gaps in the fabric of history, to expand our knowledge. Mere physical possession of historic materials is nothing. The archaeological word for this is "pothunting" and is perjorative. The curiosity and scholarship an object inspires ends up expanding our knowledge not only of the past but also the how and why. This is especially true in the history of any science which builds upon itself in patient, sequential, contemplation and research. You cannot create the SR-71 Blackbird without the Wright Brothers before you yet the Wright Brothers could never have created the SR-71 Blackbird in 1903 because the patterns did not lead there yet. The real value of historic materials are the patterns of knowledge they reflect and also the inspiration they generate. I used to work for an archaeologist named Dr. Kelso before he went on to discover the original site of Jamestown. The honor and glory of finding Jamestown made the news but it was the years of patient scholarship and careful bservation of patterns in the field that inspired him on to this discovery. The pattern of learning grows upon itself. We want to teach the how and why of the science and history of aviation at the Virginia Aviation Museum. That should be straightforward but the real magic will be the inspiration generated in the boys and girls who look at the patterns from the Wright kites to the Blackbird. Where will they go from here? That is the real magic of historic objects. As the preparation of our Blackbird continues in the desert sun of Edwards Air Force Base a large part of everyone's motivation is this bigger picture. Unlike every other day since mid September it is not hot. There is a definite chill in the air and there are clouds banked up against the west face of the Tehachapi Mountains. No wonder its a desert out here. Here on the sunny eastern side of the mountains I put on my flight jacket against the chill of the morning breeze. 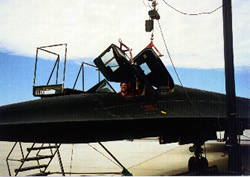 When I get to Edward's Air Force Base-South Base where the SR-71 is parked Jim and Marty are drilling away. It is getting windier. Ben is back at the motel shopping for cranes to load the aircraft on to the trucks which are now accounted for and contracted. They should start arriving in a just few days. There is still lots of work to do in this final week but our stay at Edwards will be ending soon enough. Time to hit the museum here at Edwards for souvenirs. The engineered splices that will reassemble the wings are being custom manufactured one-by-one on-site and labeled now. This means that when we get to Virginia the only thing to do will be a straight forward reassembly and final cleaning of the aircraft. I continue to clean the forward fuselage from the wing juncture forward so it will be ready for photo ops when we get to Richmond International Airport and the museum. 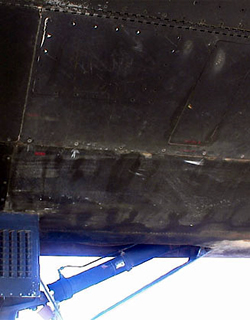 The rear of the Blackbird from the forward part of the wing back will be cleaned on-site at Richmond because of all the work yet to be done in the reassembly. The Blackbird's flat black paint shows every footprint and there will be scores of feet padding around back there between now and the final cleaning. An assortment of aircraft pass overhead in preparation for the big Edwards Air Show this weekend. The wind is really up now like a day at the beach when a front is passing and that in fact is what is happening here. When you see military aircraft rocking and rolling in the wind that signals something is up. We are in fact technically on the beach its just that the lake is dry. Flight pay is definitely being earned today. As we focus on our work the flight pattern the aircraft use changes bringing them over our heads. We also notice the blue sky on our side of the mountains disappearing in a way I've never seen before. A rolling cloud of dust is heading our way. We walk around the site and cover and secure things. I get off the ladder and start work under the Blackbird. The worst of the dust passes to our south but it is like the movies of the Dust Bowl in the 1930s. This is normal dry lake response to a stiff wind and business on the base continues per normal with the exception of headlights. When the dust clouds pass over the active runway the aircraft just skim above it and continue their pattern and formation work. One B-52 bomber is particularly exuberant and sails down at speed above the low hanging dust cloud and then vaults skyward in an amazing display of agility you don't expect to see in an aircraft the size of an airliner. When it is over there is dust all over my work but the good news is it comes right off. The embedded dust of years is still obviously gone despite this fresh dusting. If yesterday's weather signaled a change in seasons so too does today's operational tempo. Worldwide Aircraft Recovery's Ben Nattrass is all over the work site hurrying us on. Soon the trucks will start arriving and Saturday is the date scheduled for the beginning of the craning of large unwieldy aircraft components onto special trailers. I understand now why Mojave, California is our base camp instead of the less spartan cities of Lancaster and Palmdale. State Routes 14 and 58 form a nexus in Mojave and this is where the big rigs congregate. I learn that truckers congregate where motels and eateries are designed with truck parking and this describes Mojave perfectly. The days and nights of this town are punctuated with the sound of heavily laden diesels spooling up and down as they pass into and through this town. It won't be long until our convoy comes together and we will stage from here. 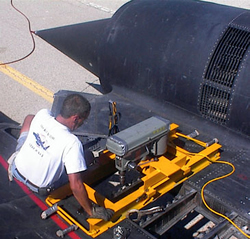 Our Blackbird will soon leave Edwards Air Force Base for the last time taking several days to complete a trip its sister at the Smithsonian's National Air and Space Museum completed in 68 minutes. I ponder on this all day when I'm surprised by a sonic boom and look up. Something really fast is pulling a contrail at altitude. I get my pocket binoculars. Is it NASA's Blackbird? It is gone before I can tell but it's thunderous salute would be a fitting farewell to our bird. We soldier on against our deadline.